Over the past several years, the school has been featured in Newsweek magazine as one of the top 100 schools in the nation. In 2006, Richard Montgomery was featured in Newsweek magazine as the 15th highest-rated high school in the nation. In 2007 number 25. And, in 2008, number 32. We’re losing ground. But, we’ve come a long way since the days of tenth grade. Of course, we were the class, that turned it around. In June 2002, it won its first award in National Scholastic Championship at George Washington University. Richard Montgomery High School was awarded the Blue Ribbon in Education Award by the United States Department of Education. In 2003, Jay Mathews from Newsweek, identified RM as the number one school in the D.C. metropolitan area in the Challenge Index for Rigor. Academics: The school houses Montgomery County's first International Baccalaureate Diploma Program (IB), which attracts top students from the entire county. It also includes the International Baccalaureate Middle Years Program (MYP), in which freshmen and sophomores take rigorous classes. The average class size is 24.8, with a student to staff ratio of 12.8:1. Upon graduation, 94.9% of the class of 2008 planned to go through a type of post-secondary school, 4% plan to go straight into the workforce and 0.9% into the military. There was a 93.9% attendance rate and a 1.4% drop out rate in 2002-2003. The student body is 44.6% White, 23.6% Asian, 14.6% Hispanic, 17% African American, and 0.2% American Indian. Currently 1,924 students are enrolled and approximately 14.9% of the student body is eligible for free/reduced lunches. Extracurricular activities:National Forensics League, musicals, plays, and choral singing have helped distinguish Richard Montgomery as a noted school for the dramatic arts. Its literary magazine Fine Lines and the Citizenship Law Related Education Program (CLREP) mock trial team have won multiple national and statewide championships and honors. Richard Montgomery's Quizbowl team (It’s Academic) is one of the finest in the nation, and has won numerous awards and honors, including a victory at the National Scholastics Championship in 2002. As of 2006, they are the highest ranked team in the state of Maryland and the Maryland state quizbowl champions. In 2006, they won the NAQT High School National Championship Tournament, defeating State College Area High School in the final at Chicago. Performing Arts have helped distinguish Richard Montgomery as an advocate for arts funding in public schools as the musicals, plays, chorus and school band are continually used as note-worthy examples of success. The Black Maskers (RMHS Drama Program) were the first high school theater group to attain the rights to perform the musical, Ragtime. “The Tide,” is one of very few schools in the entire state which has not only its own student newspaper, "The Tide" but also its own student literary magazine "Fine Lines". National Forensics League, Musicals, Plays, Choral and Instrumental ensembles have helped distinguish Richard Montgomery as a noted school for the arts. Its literary magazine Fine Lines and the Citizenship Law Related Education Program (CLREP) Mock Trial Team have won multiple national and statewide championships and honors. RM Sports is noted for its track, swimming, basketball, tennis, and soccer teams. 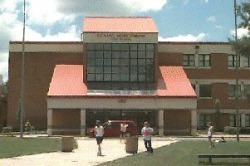 The new building in late 2007. A very different look! The new front of the building faces Fleet Street (the old football field side).